Last year I reviewed a promotion CD by Ramesses, a three-piece consisting among others of two former Electric Wizard members. 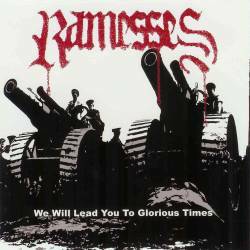 We Will Lead You To Glorious Times contains the songs from the promo, as well as the long Witchampton, opening the album, and video clips of Master Your Demons and Ramesses II. Since bands like Khanate and Sunn O))) have started making extreme doom popular (at least in the underground) again, the time is more than ready for Ramesses to overwhelm the world with their sludgy end-times sound. The aforementioned opener starts off with 9 minutes of ear-bleeding pain: slowly creeping guitars, tuned a couple of notes down, and a vocalist who could have come straight from a black metal band, except that this is no high pitched Scandinavian black mass, but far more threatening lava sounds from the very depths of England. Master Your Demons has a more traditional approach, with a grooving rhythm showing the influence of the doom godfathers Black Sabbath. From here on, it’s back to basics again. Ramesses II is combining the evil slo-mo thrash of bands like Hellhammer with a rocking attitude, the long Black Domina is a journey through the different faces of modern doom metal. Considered as an EP, We Will Lead You To Glorious Times is more than just a promising debut by scene veterans. Although only half an hour long, it cares to show how varied this supposedly monotonous genre can be. A glorious album indeed!